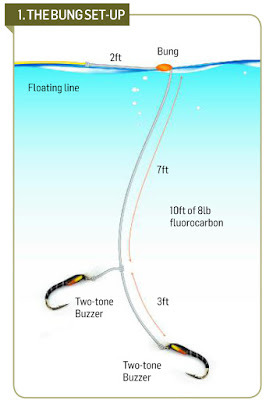 When fishing with nymphs and buzzers, the ideal conditions is to have a light 5 – 9mph left-to-right wind. This allows you to cast out and let your team of flies swing gently round in an arc. 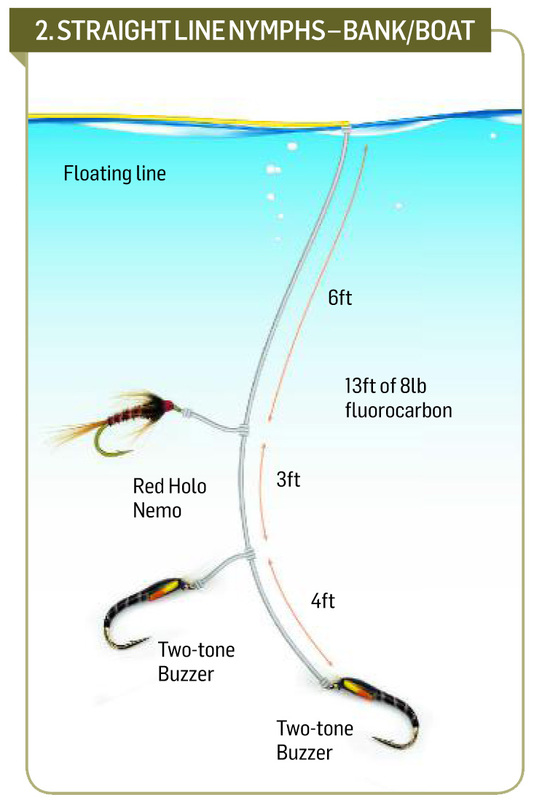 Using this method, you will regularly land fish up to 4lb. However, if you want to catch bigger fish, you'd be surprised to hear that the 'bung' or strike indicator is the answer. Straight-line nymphing catches very well in terms of numbers, but it is becoming increasingly evident that fishing static sorts out the wheat from the chaff. On a lot of UK stillwaters and reservoirs, fishing three to four feet off the bottom, usually under the bung and straight down the wind with no retrieve at all seems to be catching more fish above the 4lb mark than with straight line nymphing. 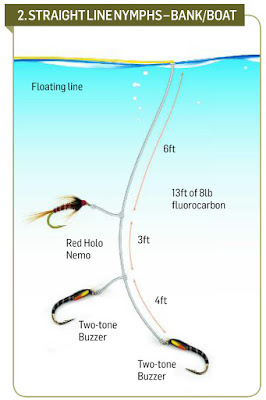 The theory is that by fishing across the wind with your flies (although moving slowly) they are actually moving too fast and look unnatural to educated fish, so they simply don't take them. Stockies and well-mended fish meanwhile, seem to love that slight movement and change of direction as it induces the take. 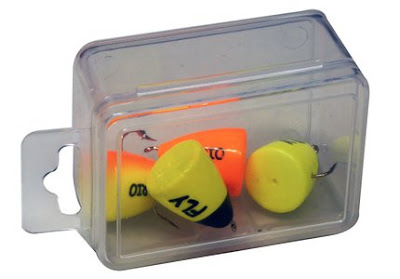 Therefore fishing with a bung gives you excellent depth control and the option of fishing your buzzers ultra-slow or static, which educated fish prefer. Of course, the bung is frowned upon by many, and some would argue that it is no different from watching a float, but if you want to be consistently successful and catch bigger fish, it is worth embracing the method and developing the patience. So why not give the buzzer/bung technique a try. 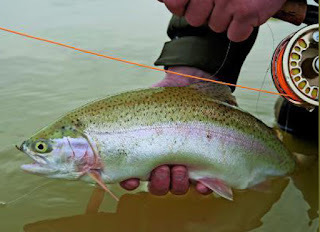 Simply use a 13ft fluorocarbon tippet material of around 8lb and fish directly into a light wind. 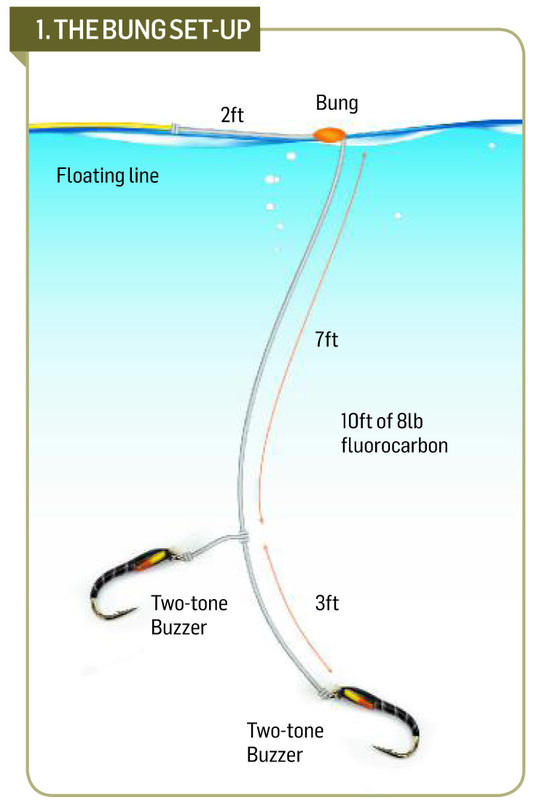 Use this setup with a floating fly line and allow your flies to drift back dead drift, with no drag, or straight down the wind. The goal is to keep them totally static. Once you see the slightest movement in the bung, lift the rod straight away. 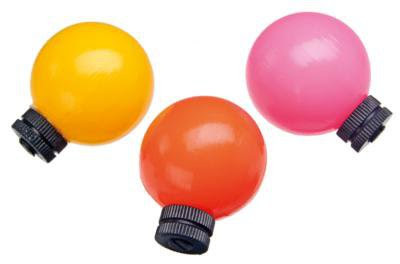 You will be anticipating a positive take and observing the bung 'going under' however try striking when there is the slightest movement of the bung, and you will be surprised by how many more fish you will hook up. 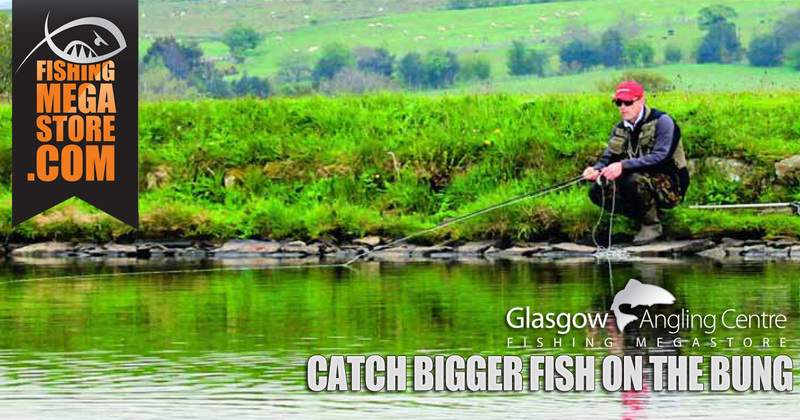 For more information on how to fish buzzers or fishing the bung, you can visit us instore at Glasgow Angling Centre or Edinburgh Angling Centre where our friendly helpful stuff can advise you on the best setups. Alternatively you can call us on 0141 212 8880. This article was brought to you in association with Trout Fisherman Magazine. what distance would you recommend for the top buzzer?